Interactive landscape containing cytoskeletal structures and proteins relevant to cellular adhesion, including an adherens junction. 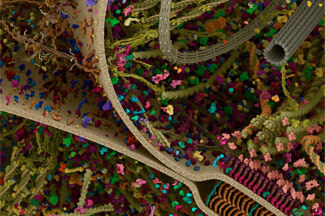 Interactive landscape containing the mitochondria, proteasome degradation pathway, and various cytoskeletal structures. Interactive landscape containing the nuclear pore complex (NPC), double bilayer nuclear membrane, chromatin, and other nuclear proteins. Interactive landscape depicting key proteins and sub-cellular structures involved in protein synthesis, including transcription, nuclear pore, translation, and endoplasmic reticulum. Interactive landscape containing multiple receptor tyrosine kinase (RTK) signaling pathways. Interactive landscape depicting key pathways and structures in vesicle trafficking, including post-translational modifications, Golgi and post-Golgi trafficking, cytoskeleton, and the endo-lysosomal compartment.